Tuxedo Sam is a tubby little Sanrio penguin who loves to eat. He likes to be called Tuxedo-san; Sam is too old-fashioned, he thinks. Sew in the eyes – it should fall on round 12. Remember to leave enough space in between for the beak. Pop in the pink brads (optional) for a blushing effect. Begin stuffing the body. Add some small pebbles so Tuxedo-san will stand upright on its own. Top off with more stuffing. Fasten off and leave a long end for sewing. Round 8: Sc across both sides, chain 2, sc in the same stitch, slip stitch in the next sc, 3hdc in the next sc, skip 1, slip stitch in the next sc, sc in the next sc, chain 2, sc in the same stitch, slip stitch in the next sc. Weave the yarn to the bottom centre of the feet. Change yarn colour to navy. Leave a long white yarn end for sewing later. For easy sewing, flatten the edges of the hat first. Round 1: Starting in second chain from hook, sc in the next 3sc, 3sc in the last sc. Round 2: Rotate the foundation row, don’t turn it. Sc in the next 3sc, 3sc in the last sc. Round 3: Rotate again. Sc in the next 3sc, 3sc in the last sc. Weave the long end of the embroidery floss to the centre then make three loops over the piece to shape the bow. Tie a knot with the shorter end at the back. Flatten the white tummy piece and sew it on the body. Sew on the feet and arms. Add some stuffing to the sailor hat to keep it in shape. Flatten the brim on Tuxedo-san’s body and sew it on – be sure to sew on the protruding part of the hat so the edges can be folded up later. Curve up the ends when you’re done. 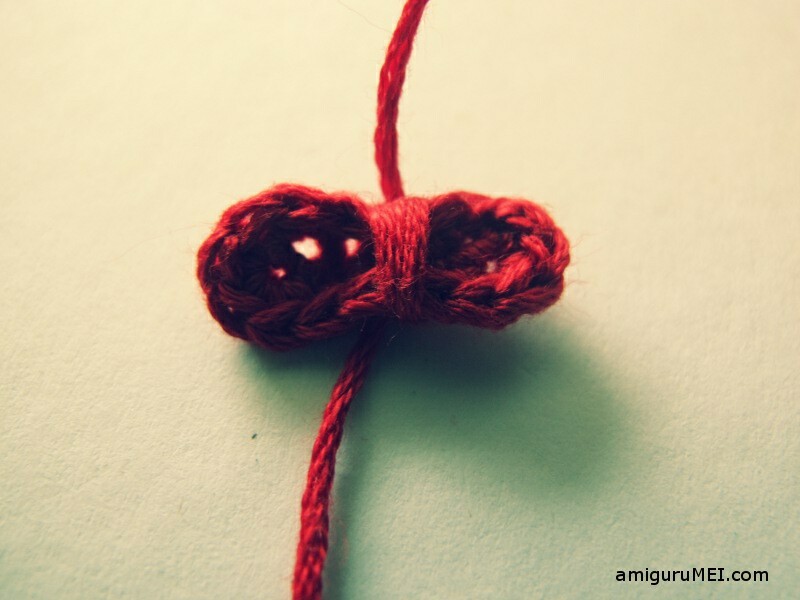 Sew on the red bow. 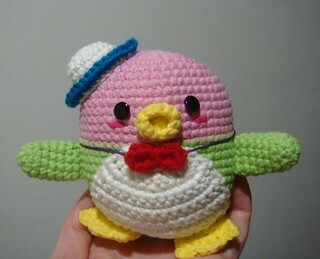 As this is an original amiguruMEI pattern, kindly do not claim it as your own. You may place a link to this pattern from your site, but please do not repost it onto your page. 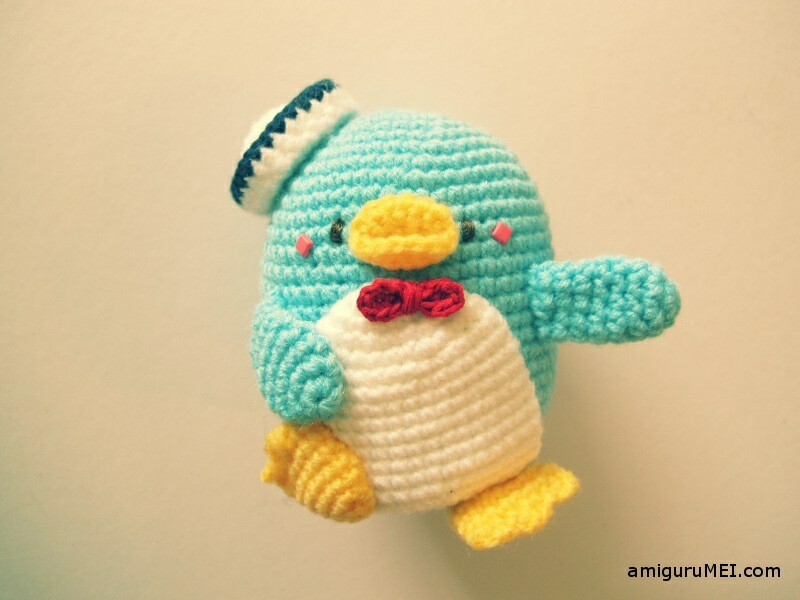 Remember to share a picture of your own kawaii versions of Tuxedo-san with amiguruMEI! 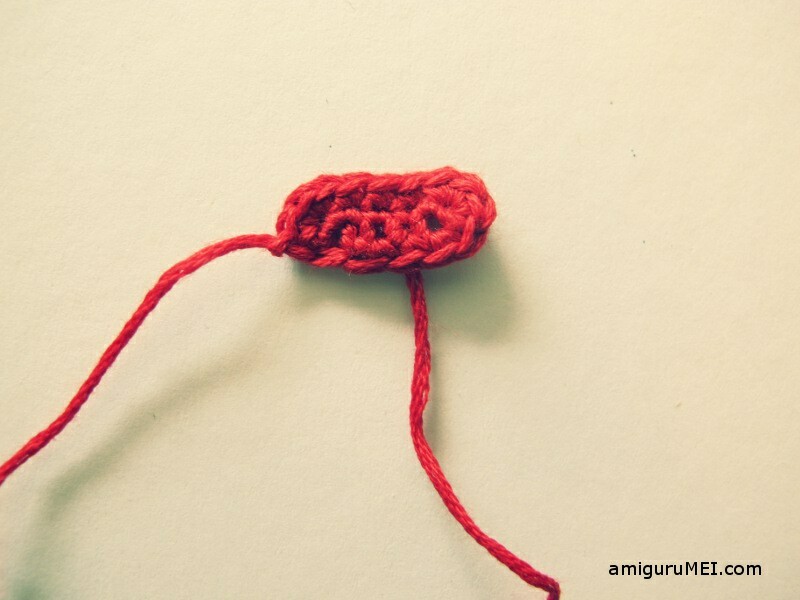 May our group crochet this creaction. If you are agree, I will translate as Chinese. OK~I will send you the link of chinese pattern. The members of our group will be joyful. By the way, this is our crochet group in FB. Just joined your group! Glad to meet all of you 🙂 I will be creating another Sanrio free pattern soon. Will let you know once I’m done! 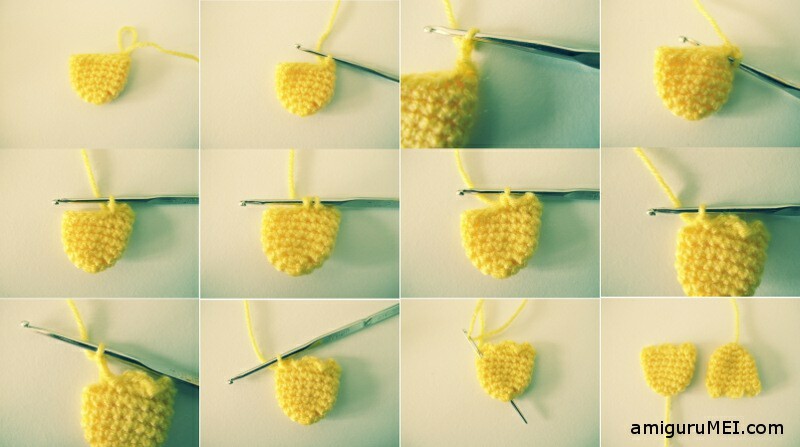 🙂 Happy crocheting! He is very cute, thanks !!!!! How cool! I LOVED Hello Kitty and Friends when I was little. Thanks for the pattern. Thank you so much for sharing the pic! I love it! I’ll be posting any Sanrio pattern soon. Do check back soon! Hi!!! I love it!!! How cuteeee ❤ ❤ ❤ thank you for the pattern!!! Please, can i translate in portuguese? Sure! Do send me a link of the pattern so I can include it here as well! Looking forward to seeing your version of Tuxedo-san! Hi, thanks a lot for your adorable tuxedo-san pattern. My daughter and I love this penguin very much. I LOVE this!! Its so cute!!! would it be okay if i made a pdf for it?? Thanks!!! hi, do you agree if I translate your pattern in French? how do you weave? also where is the embroidery dark brown floss used? sorry i must be blind if if there! 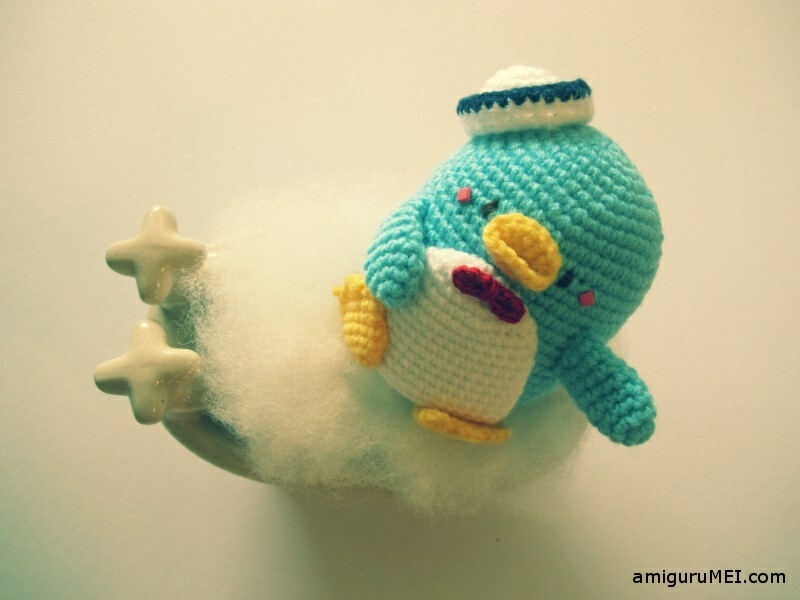 Lots of cute amigurumi patterns on this blog, check it out! This is sooooo cute! Thank you so much for sharing it! Am going to attempt this! Haha! I’m very new to all of this, so am a bit unsure of the webbed feet and the bow-tie, but he’s too lovely not to give a shot! I have created him as a teacher gift, if I can say goodbye to little Tuck. I made one as a teacher gift, if I can part with him, that is. Here you can see my little Tuck finished. Also, this may be a double post, I am not sure whether my previous post went through or not. Hi! Thank you for the pattern! How big is the final product? Awesome pattern! I finally finished putting it together after crocheting it last year!! love the lil guy! currently making one for a baby shower gift. had a question, what is an inv dec? i have never seen that term before. please help 🙂 thanks! What beautiful instructions. Is it allowed to sell the finished works? 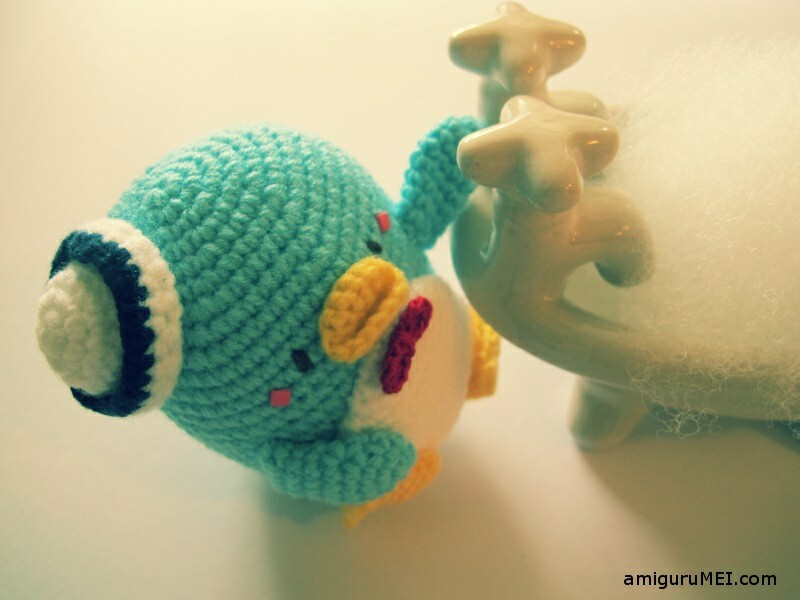 Your penguin is so so cute! Lovely yarn colours! Thank you for sharing them with me. They made me smile! This person has stolen your pattern and published it on her blog. Can you tell me how to do a magic circle? I’m new to this. 🙂 Thank you. Awww…he is so sweet. I love Tuxedo Sam! This looks a lot like your pattern – and it’s for sale. Hi Priya! Don’t worry! I think you should be on the right track. All you have to do is flatten the piece when you’re done. What ‘flatten’ means here is that instead of stuffing the piece like your usual amigurumi pieces, just flatten the piece like you would flatten a beanie hat 🙂 hope you get what I mean!